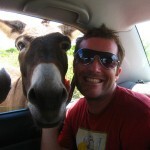 part of the crew flies over to bonaire to witness yet another brain-splitting birthday celebration amongst the donkeys. well done and thank you. “I love you donkey, I love you donkey, you’re the best donkey I’ve ever had” those words sung by Dan entirely expressed our admiration for the donkey sanctuary in Bonaire, a marvelous escale for Victor’s birthday celebration. Tagged birthday, bonaire, brian, chiara, dan, don, donkey, featured, hd, stuart, video. Bookmark the permalink.